I'm giving away 3 jackets to 3 lucky readers. International readers can join too! 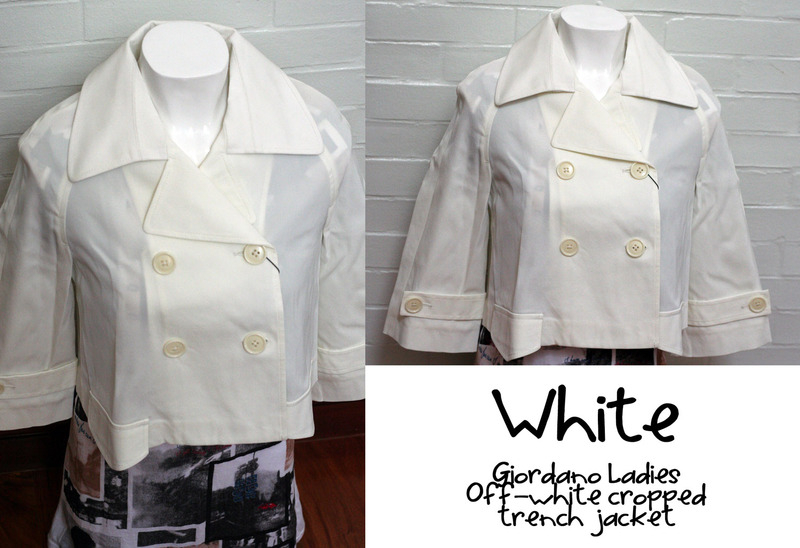 An off white cropped trench jacket from Giordano Ladies. 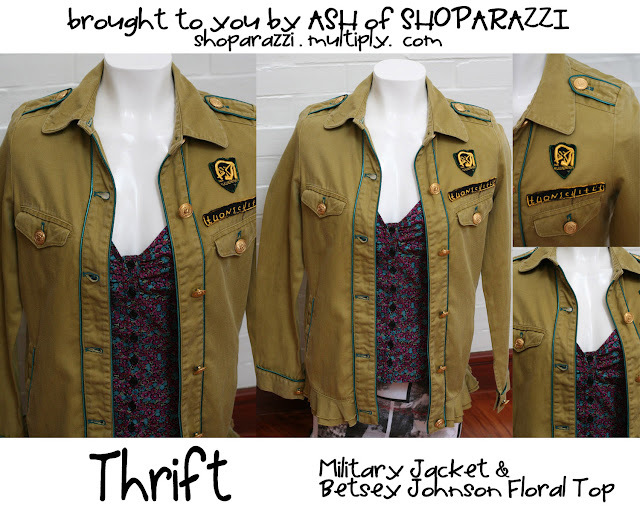 A military jacket & a Betsey Johnson top up for grabs from my sponsor Ash of Shoparazzi. Do visit her multiply site: http://shoparazzi.multiply.com/ She have loads of great thrift fashion finds! 1. Choose which jacket you want to win (give at least 2). 3. Ask a question or give a fashion challenge. 4. Don't forget to leave your name, location and email address. 5. Follow me on twitter, facebook, blogger, or Bloglovin'. 6. Spread the news! Blog, tweet, or link about the giveaway! Now it's so easy right?!? Contest will run until 20 August 2010. Jackets 2 to 3 might just be perfect for my wardrobe! fashion challenge: how do you actually stylize a hospital uniform (scrub suits)? is it even possible? -i might just be commenter #1... and random.org is less likely to choose me LOLz. Oooh! I am crushing on the white jacket, then the military one! My question: Where do you get your fashion inspiration? 5. Following you at twitter and blogger at the moment. Will follow you at FB and Bloglovin now. A fact about me: I am deathly afraid of heights..even just looking down from the 3rd floor ledge. I'm a google and Facebook follower. I love the off-white jacket and the military-jacket-and-floral-top combo! I love the Betsey Johnson Jacket and White Giordano Cropped Trench coat. State what current fashion trend that you hate or loathe, and why. I wanted to ocmment yesterday but I don't want to be the 1st entry coz it might slim down by chances of winning. hahaha! So here goes, I hope I win! * i can beatbox! hahaha! * followin you thru google! 1. Jacket 3 (lovelovelove) and Jacket 2. 2. I love Johnny Depp, takoyaki and bunnies. Thank you! May the random gods be with me. Keke. > factoid: i have myopia, and use corrective eyewear. > fashion challenge: a complete budget getup to the tune of a certain amount plus 1 more criteria. let's say shades of violet and no more than p750 or p1000? Haha! Pareho tayo Aisa! I didn't want to be the first one to comment kasi baka hindi ako yung ma-draw! Haha! 3.1 QUESTION: We all love your style but who is your ultimate (just one) style icon or style idol? I love both giordano ladies' jackets ---so classic! How many shoes do you have na? hahaha, i know. hard question! 1. I like them all!!! :D Haha! :D Love these pieces! 3. Fashion Challenge: Dress up as your fashion icon? :D Haha! 1. Military jacket (with the Betsey Johnson floral top) is first on my list, second is the black cropped jacket. 2. I'm a binge eater who functions best after a 10-hr night's rest. Yes, I love living like a pig about to be slaughtered. 3. Around how much does an average Pinay spend on shoes annually? 5. Twitter and Facebook: CHECK! 1. I love the white and military jacket! 6. Tweeted about it and tagged you! 1. Betsey Johnson or the black cropped blazer. 2. Fact # 1, I've been reading and following your blog for a long, long time and was extremely flattered when you left a comment on my blog. Fact #2, I'm such a sucker for Asian-inspired fashion and your site pretty much gives me a look into that particular perspective. 3. Question? I always notice you wearing really comfortable oxfords or brogues most of the time, so I was wondering, which do you prefer? Flats or heels? 6. Will do so! Sending a tweet! 3. If you had on a yellow dress with ruffled bottoms and the only pairs of shoes that you have at home were dunks, how would you work it? 1. 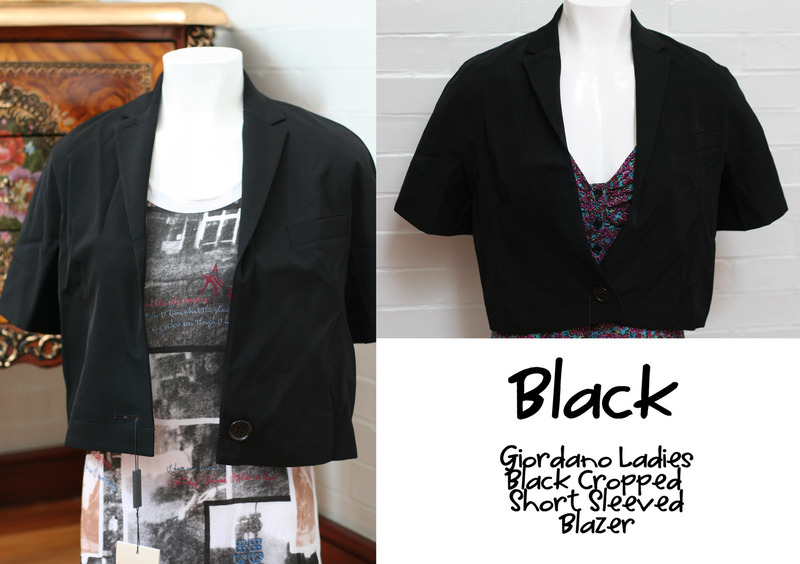 I like the black giordano ladies cropped blazer and the white giordano cropped trench jacket! 2. I am currently finding my own style again. 3. Will your style change once you become a mom? 5. Followed you on twitter! Something about me? I'm in love with NYX jumbo pencil in milk. Amazing product! *what do you think about buying branded stuff??? 2. I blog too http://spasticnotplastic.blogspot.com/ and I am a vegetarian. 3. Question- What would you pair with dark purple skinny jeans? -followed you via blogger and bloglovin' too! -tweeted about the giveaway and yes link this one in my facebook account too. Fashion Challenge is fun. Can you spend a wardrobe below $100 dollars? hehehe sorry I cannot think of a great challenge...eek!!!! from the Philippines but currently living in Bangkok, Thailand. but would love to win the jackets dear!!! Will check out your FB next. 1. I prefer the Military Jacket then the white one. 3. What's your favorite fashion era? 3. Do you know where I can buy straight leg jeans that are not skin tight? I have searched everywhere for them, but all I can find are skinny jeans/jeggings. Ugh! 5. I follow your blog via Google Friend Connect. I am in LOVE with the military jacket :) I could also style the white jacket nicely as well! What is one clothing item you couldn't live without? My first choice would be the white giordano and second would be the black giordano jacket! Fashion challenge would be wear everything mismatched and still look good..though im not sure if thats much of a challenge! I already follow via GFC! and bloglovin too! Oh wow, I can't believe I haven't joined this yet! 1) It's hard to choose, but I like the white jacket and the military jacket. 2) I used to think fashion was frivolous and stupid! Now look at me. And my closet. And my dwindling savings account. 5) I'm following you on Twitter now! 2. I have a fashion advocacy: C.L.E.A.N. Fashion, i explained this in my very first post of my blog. I love wedges. 3. Are you a wedge lover? How high can you go with your wedge? 2. I miss our Livejournal days. And I miss those days I can dress up however I want. Lack of time and lack of resources are sad facts of my life. BUT thanks to you, I still have my daily fashion inspiration! 5. Following you on Twitter and I've got you a link in my dailies, as seen on my silent blog. 6. Will definitely tweet about this! 2. i'm not wearing branded, but wearing something comfort. make a link on my side bar, check out! 3. Fashion Challenge! First off, it's cool that you're preggy and you still look awesome. Have a photoshoot featuring preggy clothing but still fashionable. 2. I am a 51-year old mother of 4 who loves fashion! 3. What do you recomment women in their 50's wear? 1. Jacket 2 & 3! 3. Can you stand walking for the whole day wearing heels when you're pregnant? 3. Fashion No-No's when preggy? 3. I love how you style your clothes and work around being preggy :) Question: what's your wardrobe must have? -- I also started my own online blog which revolves around my children's funny antics and some letters I wrote so when they are older, they could see how they were. --How do you dress up while nursing? Most nursing tops are expensive and would look dated and the inexpensive ones are not that fashionable. i can't take my eyes off jacket #1! next is jacket #3, because i love the top sooooo much! i followed you on twitter and blogger, and liked your facebook page already. 1. I would love to win the white trench jacket and the military jacket. 2. I am a twenty-something law student who loves to listen to rock music while studying. Hee. 3. We're required to show up in corporate outfits four times a week, how can you take the "boring" out of suits and come up with 'corporate chic'? 4. Donelle Khan, Iligan City, legallybugged at gmail dot com. 5. Following you on Bloglovin'. 1] i really really want the military jacket and my second choice would be the white cropped jacket. 3] how many pairs of brogues do you have? 2. I was born in a car. 3. What's the difference between an oxford, a brogue and a derby? I can't seem to tell which from which haha! Here's a fashion challenge: Wear in 5 days--trends/color that you usually do not wear. 2. I'm a rookie in this "blogging industry"